This is the first opera hall outside the City of Buenos Aires equipped with the design and technology needed to provide first class entertainment. The Main Hall, which can host 1,129 spectators on 3 levels, can seat a symphony orchestra of about 100 musicians in the pit. The Secondary Hall room seats 190 spectators and meets the necessary requirements for theatrical performances, song, dance, etc. 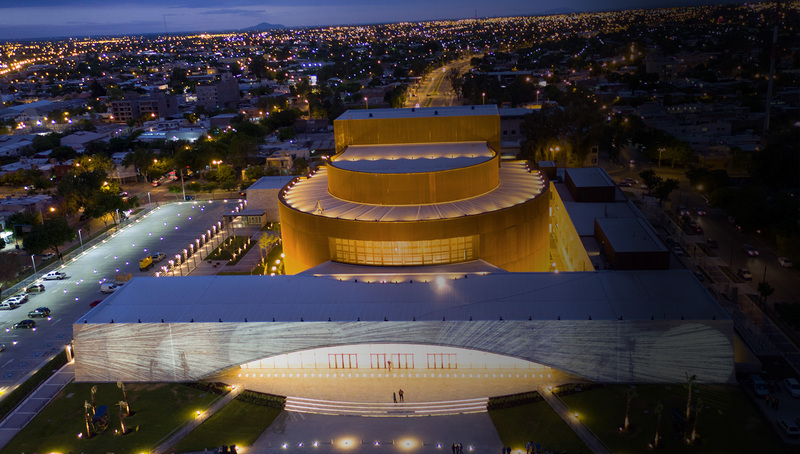 Throughout the entire construction process, the Teatro del Bicentenario followed the highest standards of sound quality recommended by the expert engineers Gustavo Basso and Rafael Sanchez Quintana, who have achieved worldwide recognition for thier work on the remodeling of the Teatro Colón, the Teatro Argentino de la Plata, “Blue Whale” of the CCK and the Usina del Arte, among others. The cultural complex is equipped with all the technical and artistic supporting infrastructure typical in the the great theaters of the world: support areas for artists, production workshops for scenery and costumes, rehearsal rooms, public services areas, administrative, teaching, etc. . The complex is able to host the production, preparation and presentation of various different kinds of shows such as opera, ballet, symphonic and choral concerts, chamber music, recitals, prose theater and other cultural events. A project designed to be the engine of culture in San Juan and in Argentina.